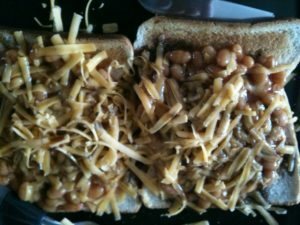 Heinz Beanz are a favourite quick snack or lunchtime meal in our house. The new reduced salt and sugar Fridge Pack is an excellent addition to the range. As a mum I am always on the look out for alternatives which are lower in salt and sugar for my children. What I love about the Fridge Pack is that it is easy to open, none of the can openers or snapped ring pulls to worry about. It’s twist, peel off the protective layer and pour. I don’t know about your house but a small tin is never enough for two little ones to have for their lunch and a big tin is just too big, it goes to waste. So the Fridge Pack is the perfect solution. You pour out the required amount, there are marks on the side making measuring out a serving very easy and then pop the rest back in the fridge. It keeps fresh for 5 whole days. Pretty good going I think. The boys love just eating Heinz beanz on their own in a bowl. Sometimes we add some grated cheese to the top. However I like to have my beanz on toast, grated cheese and some Worcester sauce, mmmm. A perfect and yummy lunch. Another favourite is on a jacket potato, mmmm. How do you eat baked beanz? 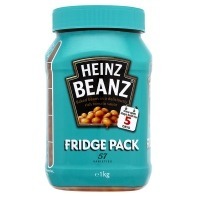 I have bought the Heinz Beanz Fridge Pack several times since getting this one, so there is no doubt we love these. Reduced Salt and Sugar Heinz Beanz Fridge Packs are available from major supermarkets including Tesco, Asda, Morrisons and Co-op from July RRP £1.93. However Asda have them on special offer for £1 just now, so what are you waiting for? Disclaimer:- I was sent a pack of Heinz Beanz Fridge Pack to review, however, the views above are my own.